ROW continually provides funds to aid groups interested in improving Downtown Wilmington. Those funds are provided through ROW's annual Back Door Kitchen Tour. A grant request must first be submitted to ROW for consideration by the Board. Scroll to the bottom of the page for information about submitting a request. A grant for $2,000 was given to the Bellamy Mansion for needed roof repairs resulting from Hurricane Florence. A grant for $2,000 was also awarded to the Burgwin-Wright House for an appropriate fence around the existing air conditioning unit. Darla Hamby, ROW membership Chair, Margi Ericson, ROW Grant Chair and Ginger Gerrard, BDKT Chair. Behind them are Captain Terry Bragg and ROW Mayor, Phoebe Bragg. ROW awarded a grant to the Children's Museum for $2500. 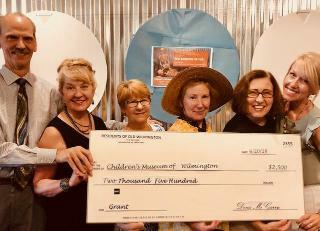 (Above)The check was presented to Jim Karl, the Museum's Director, by ROW President, Phoebe Bragg (on the left), Grant Chairperson, Margi Ericson, and Board members Ginger Garrard, Beverly Grasley and Darla Hamby. The grant from ROW was in support of renovation and expansion of “The Science of You”, a STEM exhibit. The exhibit includes life size models, hands-on displays and virtual reality technology to allow children to explore how their bodies function and master concepts in life biology, basic chemistry and the physics of movement. 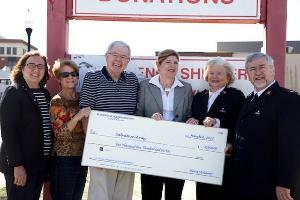 ROW awarded a $2500 Grant to the Salvation Army for repairs to the Salvation Army Church on Third Street. The grant was awarded in 2016. 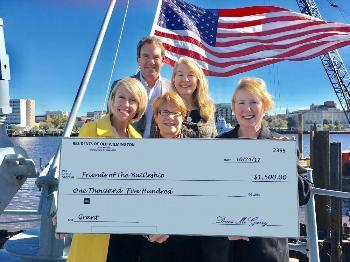 The check was presented by ROW Board Members, Beverly Grasley, Margi Ericson, Paul Mason and then ROW President, Sylvia Kochler. Over the last several years we have distributed over $62,000 to groups ranging from the Hannah Block Historic USO to the Dreams Center and Bellamy Mansion. ROW bought a piece of art and donated it to the City in 2010. 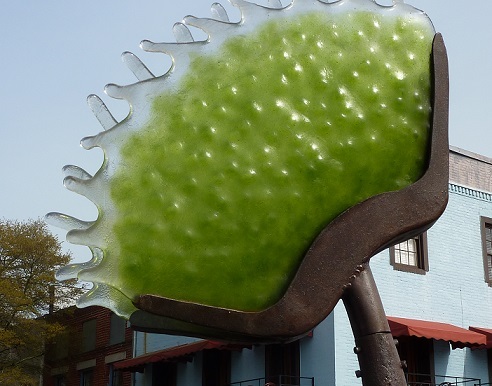 If you've admired the "Southern Hospitality" sculpture of the Venus flytrap at the foot of Market St. you've seen the work of ROW's Grants Committee. Do you have a project that ROW should support? Click on THIS LINK to download an application. Click this link to fill out the form. The Palm Trees that were planted on Second Street adjacent to the Post Office parking lot are shown in the before and after pictures below. The difference the trees made is easily seen. The Wilmington Railroad Museum will be repainting the historic sign Atlantic Coast Roalroad barely visible on the West end of the building. You can just see it above the awning. ROW was honored to make a grant that will make this possible. ROW President Paul Lawler presents the check to Railroad Museum Executive Director Mark Koenig as Bill Massey and Sylvia Kochler look on. ROW President Paul Lawler presents a Grant Check to Jocelyn Lynch of the Burgwin Wright House. Immediate Past President Robert Erb and Secretary Sylvia Kochler look on. The grant will provide lighting to the front of the house highlighting its beautiful features.